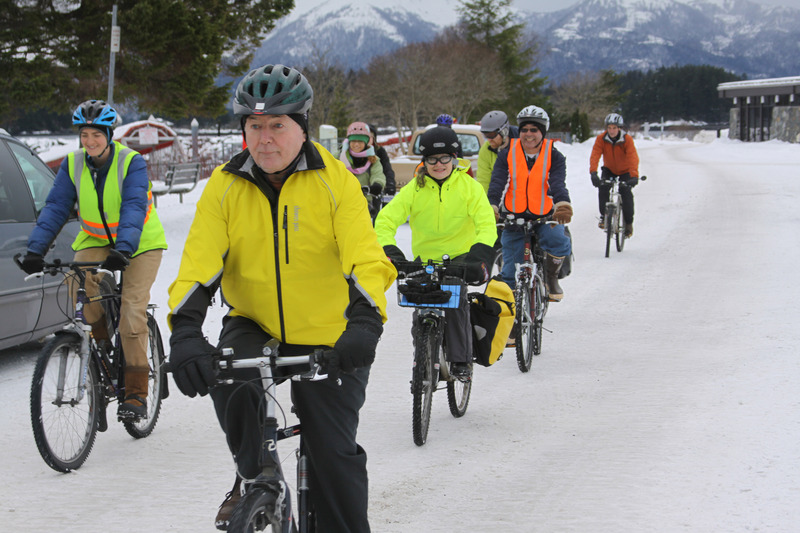 In 2008, Sitka became the first Alaska community to earn a Bicycle Friendly Community award. 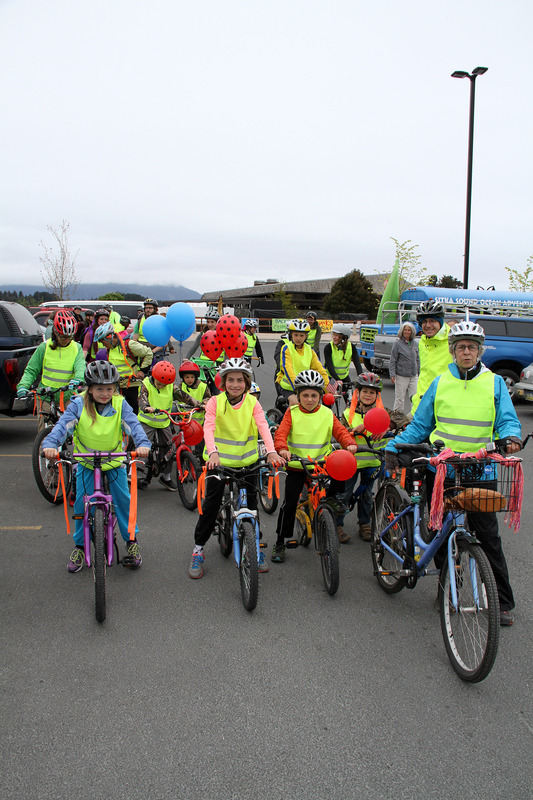 On Monday, May 14, Sitka became the first Alaska community to earn a renewal of its Bicycle Friendly Community designation. 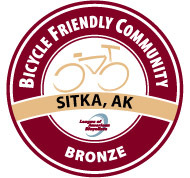 With Monday’s national announcement to kick off National Bike to Work Week, Sitka maintained its bronze level designation in the Bicycle Friendly Community program run by the League of American Bicyclists. Sitka now is one of three recognized communities in Alaska (Anchorage earned a BFC designation in 2009 and Juneau in 2011, also at the bronze level). There currently are 214 communities in 47 states with Bicycle Friendly Community designations (at the platinum, gold, silver and bronze levels). Sitka’s award is good for four years, expiring in February 2016. Sitka first applied for the Bicycle Friendly Community program as one of the community health priority projects chosen during the 2007 Sitka Health Summit, and it was the first project completed. 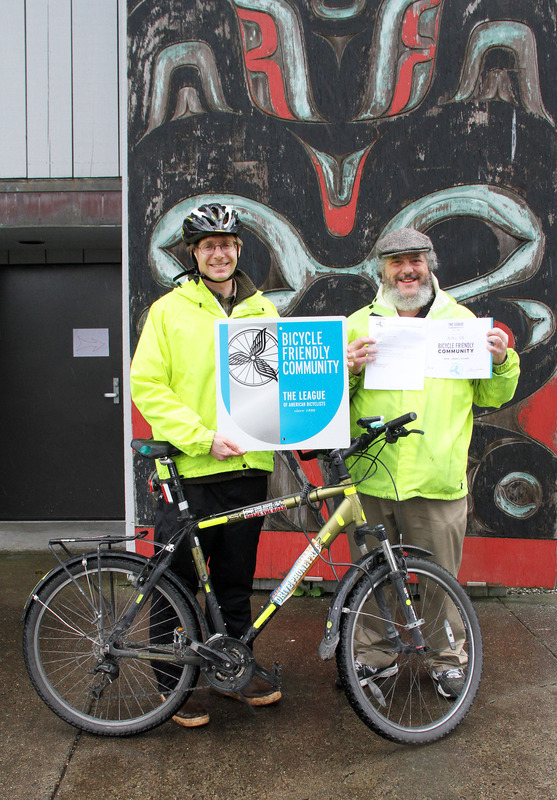 The 2011 Sitka Health Summit supported renewing Sitka’s status as a Bicycle Friendly Community. The 2012 Sitka Health Summit takes place on Oct. 3-6 at a variety of locations around Sitka. Over the past five years, the Sitka Health Summit resulted in high-profile projects such as starting the Sitka Farmers Market, expanding community gardens in Sitka, supporting the Hames Athletic and Wellness Center, bringing local businesses and insurance companies together to promote employee wellness programs, the Choose Respect mural about domestic violence prevention, planting fruit trees in Sitka and the award-winning Fish to Schools project. Doug Osborne of the Sitka Bicycle Friendly Community Coalition poses with one of the Bicycle Friendly Community signs Sitka will be hanging around town. Doug is in the bike shelter at the SouthEast Alaska Regional Health Consortium (SEARHC) At Kaník Hít Community Health building in Sitka. 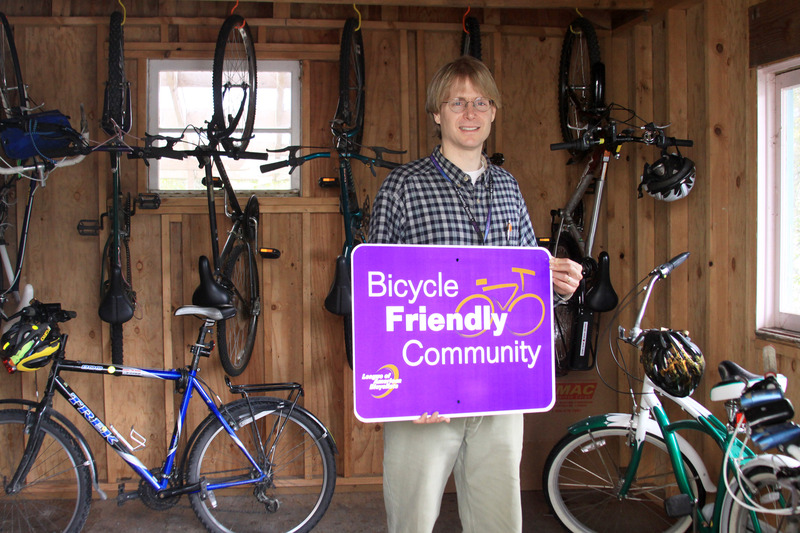 SEARHC’s Sitka Campus has a Bicycle Friendly Business designation. In the application feedback form provided by the League of American Bicyclists, Sitka received high marks for its number of regular bike commuters (4.9 percent, nearly 10 times the national average and five times the state average), Sitka’s promotion of National Bike Month events in May, the Share-the-Road and Be Safe Be Seen education campaigns, cycling workshops, the low number of motor vehicle/bicyclist crashes (only eight in five years reported to Sitka Police), and for several unique cycling events. 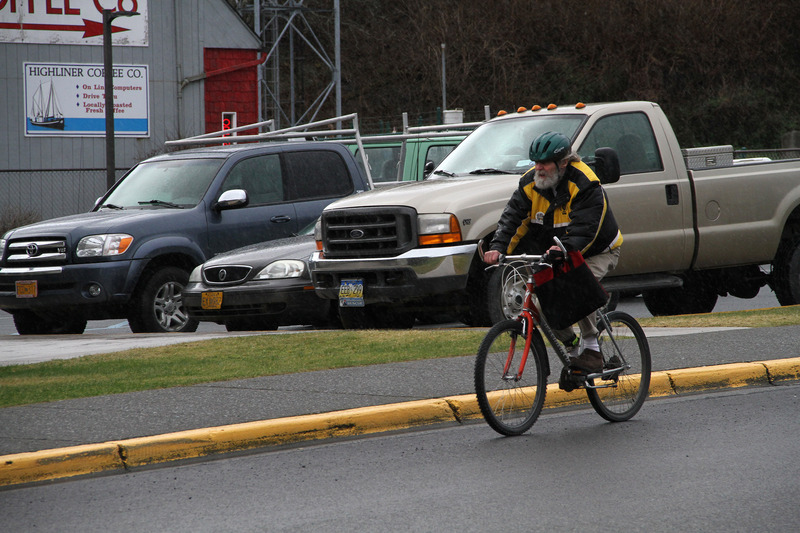 The Sitka campus of the SouthEast Alaska Regional Health Consortium (SEARHC), Sitka’s largest employer, earned a bronze level Bicycle Friendly Business designation in September 2011. In order to earn a Bicycle Friendly Community designation, communities have to complete an application that covers five main focus areas called The Five E’s — Engineering, Education, Encouragement, Enforcement and Evaluation/Planning. There are more than 100 questions in the application, asking everything from how many miles of bike lanes to how many schools participate in the Safe Routes To School program. Communities also are asked about their biking or non-motorized transportation plans and how they are meeting their goals. Monday’s announcement saw 49 communities earn new, improve or maintain current Bicycle Friendly Community designations. 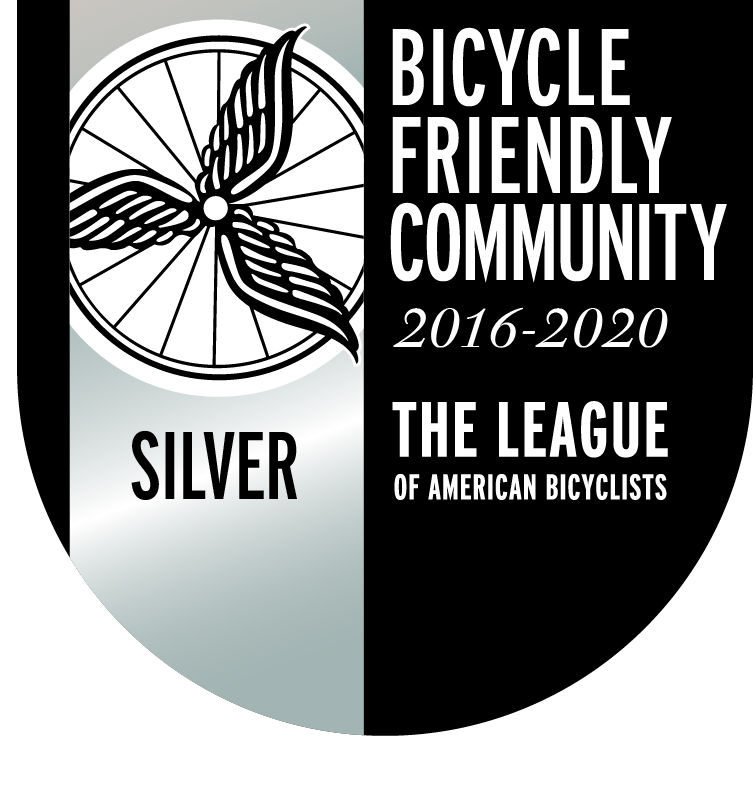 The Bicycle Friendly Community program is part of the larger Bicycle Friendly America program that includes Bicycle Friendly State, Bicycle Friendly Business and Bicycle Friendly University designations. In addition to the League of American Bicyclists, the Bicycle Friendly America program is supported by Bikes Belong and Trek Bicycle’s One World Two Wheels Campaign.